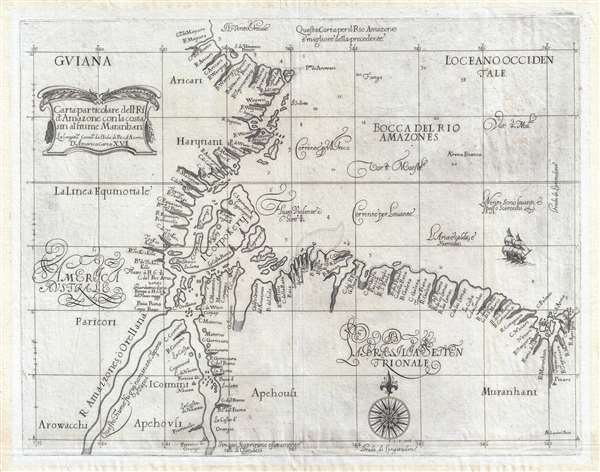 One of the earliest maps to show Dutch merchant activity in the Amazon. Carta Particolare dell'Rio d'Amazone con la costa sin al fiume Maranhan. This is a fine example of Robert Dudley's rare 1647 nautical chart or maritime map of the mouth of the Amazon River, Brazil. This map was issued for the Dell'Arcano del Mare, one of the greatest nautical atlases of all times. It covers the region surrounding the mouth of the Amazon from French Guiana (Guiana) to the mouth of the Mearim River and the Baía de São Marcos in Brazil. Although covering only the mouth of the Amazon River, this is one of the earliest maps to show any part of this area at a large scale. The whole is rendered in the unique idiosyncratic style that is immediately identifiable as Antonio Francesco Lucini's work. Dudley's cartographic information appears to derive primarily from, coastal pilot accounts, as well as the Teixeira expedition of 1639, and Orellana's voyages of 1541- 1542 and 1544 – 1546. The river is identified as both the 'R. Amazzones' (River Amazon), after a supposed all female tribe Orellana heard about on his first voyage, and the Orellana, after the conquistador himself. Despite covering a broad area, the map identifies only limited European presence Fort Oranje, Fort Nassau, Waterhuis, and Pinaro. Forts Oranje and Nassau were Dutch trading posts constructed on the Xingu River. Dudley may have transposed the locations of the forts, as Nassau was actually further south. Both were abandoned around 1617. Waterhuis was a Dutch supply station. Records of Dutch entradas into the Amazon are sketchy and incomplete, but what is known is remarkable. Evidence suggest that Dutch traders probed deep into the Amazon and forged working relationships with the indigenous peoples. East of the mouth of the Amazon is the city of 'Pinaro,' which may refer to Belem. An extraordinary achievement, this map was one of 130 published in the 1647 edition of Robert Dudley's Dell'Arcano del Mare, the first maritime atlas of the world. It was engraved in Florence by Antonio Francesco Lucini. Sir Robert Dudley (7 August 1573 - 6 September 1649) was an English explorer and cartographer, the publisher of the Dell’Arcano de Mare, one of the greatest nautical atlases of all time. He was the illegitimate son of Robert Dudley, 1st Earl of Leicester (a favorite of Queen Elizabeth I) and Douglas Sheffield, the widow of John Sheffield, 2nd Baron Sheffield. In 1594, Dudley led an expedition across the Atlantic, with the intent of harassing Spanish merchantmen. His expedition met with a series of misfortunes, but successfully returned to England the following year. In 1596 Dudley joined an expedition led by Robert Devereux, 2nd Earl of Essex, against Cadiz. He served as the commander of the Nonpareil, and was knighted for his conduct in the capture of Cadiz. In 1603, Dudley made an attempt to establish his legitimacy at court and gain several inheritances, after being (possibly erroneously) informed that his parents had been secretly married. No concrete proof of the marriage could be furnished, thus the judgement was handed down against him in May 1605. Dudley left England in July of the same year, with his lover and cousin Elizabeth Southwell, who was disguised as his page. They married in Lyon in 1606 having receiving a papal dispensation. The couple settled in Florence, where Dudley began using his father’s title, Earl of Leicester, and his uncle’s, Earl of Warwick. In Florence, Dudley designed and built warships for the arsenal at Livorno and became a naval advisor to Ferdinand I, Grand Duke of Tuscany. In 1607, James I revoked Dudley’s travel license once ordered that he return to provide for his deserted wife and family. Dudley refused, was subsequently labeled an outlaw, and his estate was confiscated. By far Dudley’s most import work was the Dell’Arcano del Mare (Secrets of the Sea). This work consists of six known volumes that illustrate Dudley’s extensive knowledge of navigation, shipbuilding, and astronomy. His most celebrated achievement, is the atlas of sea charts of the world which is part of the work. This maritime atlas was the first nautical atlas of the entire world in print, the first made by an Englishman, the first to show prevailing winds and currents, and the first to use the Mercator projection. 130 maps were included, and all of his maps were original, not copied from other cartographers. Their style is distinct and instantly recognizable. Some of their idiosyncratic style should be attributed to Antonio Francesco Lucini, Dudley's engraver. Antonio Francesco Lucini (1610 - c. 1661) was an Italian engraver and printmaker, best known for his work engraving Sir Robert Dudley's Dell’Arcano del Mare. Born in Florence, Lucini studied etching under Stefano della Bella and Jacques Callot. Lucini worked on a series of engravings entitled Disegni della guerra, aside dell’armata turchesca all’Isola di Malta l’anno MDXLV published in Bologna in 1631. By far his most famous work is Dudley’s Dell’Arcano del Mare, which he stated took 12 years to engrave and required over 5,000 pounds of copper to produce the plates. Dudley, R., Dell'Arcano del Mare (Florence) 1645. Dell’Arcano del Mare (Secrets of the Sea) is a six volume 17th century maritime encyclopedia by Sir Robert Dudley. The sixth volume of Dudley's encyclopedia is a revolutionary maritime atlas of the world. It is considered on of the most important atlases ever produced. The Arcano del Mare was the first of its kind in print, the first by an Englishman, the first to illustrate prevailing winds and currents, and the first to employ the Mercator projection. It was published in Florence in 1645 and 1646 in three folio volumes. Another edition, in two volumes, was issued in 1661 but contained fewer charts. The charts themselves are notable for being all new works, created by Dudley in his idiosyncratic style, with the most up to date cartographic data available at the time. OCLC 164795308. Boston Public Library, Leventhal Map Center, G1059 .D84 1647. Shirley, R., Maps in the atlases of the British Library, M.Dud-1a, 128.